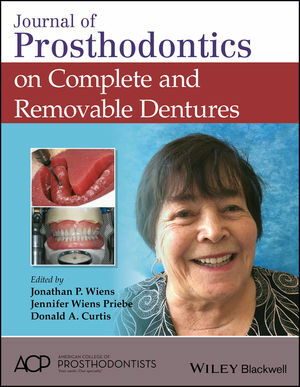 This book is a compilation of articles on complete dentures selected from the Journal of Prosthodontics with the intention of providing the reader with contemporary and relevant information on how the edentulous patient can be better served when fabricating complete dentures. Jonathan P. Wiens, DDS, MSD, FACP, is in private practice limited to prosthodontics in West Bloomfield, Michigan, USA. He is also Clinical Professor at the University of Detroit Mercy in Detroit, Michigan, and attending staff maxillofacial prosthodontist at Beaumont Hospital in Royal Oak, Michigan. Jennifer Wiens Priebe, DDS, MS, FACP, is in private practice focusing on maxillofacial prosthodontics in West Bloomfield, Michigan, USA, and attending staff maxillofacial prosthodontist at Beaumont Hospital in Royal Oak, Michigan. Donald A. Curtis, DMD, FACP, is a Professor in the Preventive & Restorative Dental Sciences Department, School of Dentistry, San Francisco, California, USA. He also maintains a private practice limited to prosthodontics in Berkeley, California.